There is a printing error when going from the bottom of column 1 to the top of column 2. At the top of column 2, answer choice “(e)” should be in bold type and there should be a period after “1/16.” The remainder of the text should be deleted because it repeats the previous sentence. Mission Juno website hosts a wealth of Jupiter resources, including news, discussions, images, movies, and explanatory animations about the mission, its science goals and what we know about the Solar System’s largest planet. A special feature is a series of 9 short movies from Bill Nye “the Science Guy”! See the Mission Juno website from the Southwest Research Institute (SwRI). More than 400 years after its discovery by Italian astronomer Galileo Galilei (see Figure 3-2, p. 38), the largest moon in the Solar System – Jupiter’s moon Ganymede – has finally been fully mapped (see Section 7.1g(iii), pp. 175–176). Since its discovery in January 1610, Ganymede has been the focus of repeated observation, first by Earth-based telescopes, and later by the flyby missions and spacecraft orbiting Jupiter. These studies depict a complex, icy world whose surface is characterized by the striking contrast between its two major terrain types: the dark, very old, highly cratered regions, and the lighter, somewhat younger (but still very old) regions marked with an extensive array of grooves and ridges. Scientists have now produced the first global geologic map of Ganymede, Jupiter’s seventh moon. The map combines the best images obtained during flybys conducted by NASA’s Voyager 1 and 2 spacecraft (1979) and Galileo orbiter (1995–2003) and is now published by the U.S. Geological Survey as a global map. It technically illustrates the incredibly varied geologic character of Ganymede’s surface and helps planetary scientists to make sense of the apparent chaos of its complex surface, in order to decipher the icy world’s evolution. It will also enable researchers to compare the geologic characters of other icy satellite moons in the Solar System. The European Space Agency’s Jupiter Icy Moons Explorer mission is slated to be orbiting Ganymede around 2032, with instrument contributions from NASA. Earth-bound astronomers can observe Ganymede (with binoculars) in the evening sky this month, as Jupiter is in opposition and easily visible. Links: JPL press release; a rotating Ganymede movie; the geologic map. On a recent public radio broadcast, Philip Marcus, professor of fluid dynamics at the University of California Berkeley, explains the persistence of Jupiter’s Great Red Spot (see Section 7.1b, p. 170). The Great Red Spot is huge – 36 times larger than the United States, and its winds, which clock in at 250 miles per hour, surpass those of the most violent hurricane. But, its most baffling property is its multi-century lifetime. Scientists believe that the Red Spot should have lasted just a few years. It avoids being torn apart because it is sandwiched between layers of cold and hot air. But, those layers should have warmed and cooled their ways to oblivion in only 5 years or so and taken the Red Spot along with them. So why is the Red Spot still here? One explanation is that the Great Red Spot merges with, and absorbs, smaller “spots”. It was thought that by cannibalizing smaller spots, the Red Spot could stay alive indefinitely, but now we know. That diet is too meager. Dr. Marcus’s group recently found a new explanation for the Red Spot’s longevity – it has weak, vertical winds. Like storms on Earth, the vertical winds of the Great Red Spot appear to be negligible; they are hundreds of times smaller than the horizontal winds. Therefore, previous studies ignored them. To their surprise, when they accurately calculated the vertical winds using computer models, the Red Spot’s lifetime increased from 5 years to 800 years. The vertical winds escaped the Great Red Spot and then threaded through the atmosphere, where they harvested energy from the surrounding air. When the winds returned to the Red Spot, they brought their bounty, and that excess energy has sustained the Great Red Spot for centuries. Links and source: WAMC’s Academic Minute. Stephen Hawking, very famous for his ideas about black holes seeming to emit radiation (dubbed ‘Hawking radiation’) and also well known for his ability to function as a theoretical astrophysicist in the face of tremendous personal disability, has made some recent statements in a new paper that seem to challenge the nature of black holes’ event horizons (see Section 14.3, p. 363). It looks like this theoretical debate is set to continue. Links: accessible New Scientist article and overview of the Firewall Paradox; New Republic overview; Nature news article; Preprint of Stephen Hawking’s paper. The Astronomy Picture of the Day (APOD) on February 4, 2014, shows star birth in action: a bipolar particle beam is seen, forming what we call a Herbig-Haro object, named for astronomers George Herbig and Guillermo Haro (see Section 12.1b, pp. 314-316). The powerful jet likely contains electrons and protons moving hundreds of kilometers per second. 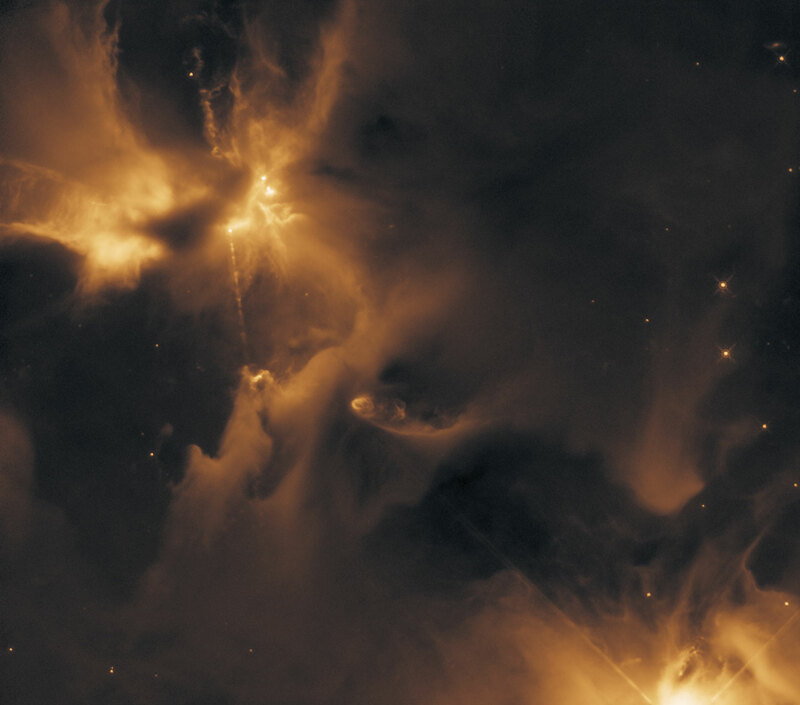 The above image was taken by the Hubble Space Telescope in infrared light in order to better understand turbulent star forming regions known as Young Stellar Objects (YSOs). Frequently when a star forms, a disk of dust and gas circles the YSO causing a powerful central jets to appear. In this case, the energetic jets are creating, at each end, Herbig-Haro object 24 (HH 24), as they slam into the surrounding interstellar gas. The entire star forming region lies about 1,500 light years distant in the Orion B molecular cloud complex. Due to their rarity, jets like that forming HH 24 are estimated to last only a few thousand years. Links: APOD, February 4, 2014.